The workmanship on the woodwork of many machines is of very high quality as illustrated by the use of dovetailed joints, marquetry & parquetry and various veneers as well as solid wood finishes. Once made the woodwork was finished by French polishing. We think some of the Cases and Bases deserve recognition as works of art. Here are some of our favourites. This is the case off our Singer No.3 V.S. December 2nd 1889. As a treadle conversion, it has never had handles. The decals run the full length of the front and depicts acorns and leaves, with a central Singer Badge Logo. The head is in a four drawer table, with an extension flap. The stand is quite substantial, there are rampant Lions cast into the sides. The treadle stand on the Oscillator is very robust with a large wheel compared to other machines, but the foot plate is quite small. The case was not as well made, being only thin ply and requires restoration. It has a pretty central panel. The locking mechanism is unusual, a lever action swings a 'rod' under the arm of the machine. We found the head with its superb Peacock Tail Decals and all its associated woodwork at a local antique fair. It has taken a good few years but we finally found a suitable stand and now have a complete Singer 12 treadle. Note the large Singer logo which is cast into the centre of both sides of the stand. This is the case and base from our Singer No.2 V.S. Treadle. The base has a single drawer and the wood work is in incredible condition for its age, it dates from 1891. One application of Linseed oil and it was gleaming. Jones Medium Transverse Shuttle. Serial No. 12502. The rectangular case has a lock on the top which swivels a wood wing under the arm of the machine. The wing is mounted on an adjustable plate to ensure easy operation. The case has two recesses to accommodate the bobbin winder. Note the accessory box mounted on the table. The machine is mounted almost centrally on the stand, compare this to the later machine below. Jones Medium Transverse Shuttle. Serial No. 20296. This shows a slightly later machine the lid is more rounded. It has a single small drawer with recessed handle. The head is offset to the right on this machine with the wheel outside the stand so a dress guard was not required, as a result the linkage from the pedal to the wheel was changed. 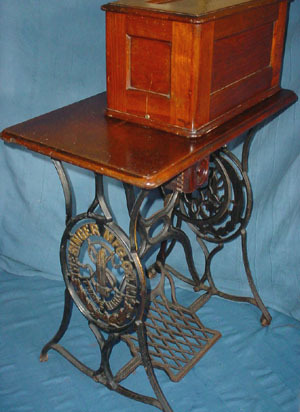 The treadle stand is also a different shape. It has slightly worn decals on the front but they are intact on the back. The pedal has Jones & Co cast into it and is different to that of the above machine. Jones Medium Transverse Shuttle. Serial No. 33774. This shows a later machine It has the same shaped table but with a single central swivel drawer and recessed handle. Note the gold lining to the stand and the colour of the pitman. The stand itself is the same as the machine above. Our first machine. A Jones Medium Spool, full rotary hook machine. It has a neat coffin case atop a three drawer table. The stand still has the decals on the front of the legs and cross brace. A Singer 27 from 1895. It has a drop leaf five drawer table, with the typical Singer coffin case. The stand has the Singer badge in the side of the legs but not the name on the cross brace as in later models. This case is tiny! It is from the Saxonia and measures 15" long and 8 1/2" high. It is the smallest case we have. This case is from our Naumann. It is slightly larger than that of a Frister and Rossmann. It has a central walnut veneer panel surrounded by an inlaid border. The handle is very plain. The case from a Frister and Rossmann. Again with the central walnut veneer and an inlaid 'ribbon' border. The handle is very ornate with an embossed FR in the centre supported either side by a 'serpent style' scroll. Later handles seem to be a lot plainer. The case from the Varley. This case is very well made with the ends being over � inch thick. There is an attachment box inside, which had a slide cover, unfortunately missing. Varley Medium Transverse Shuttle. Serial No. 70705. The machine is in a four drawer stand with extension flap. 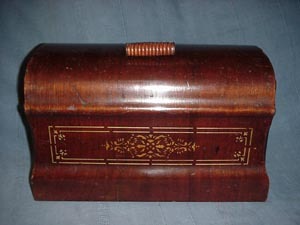 The case has a lift up lid and is held in place with a wooden swivel. The case from the Eclipse Family, it appears similar to a Bradbury case but does not have the lift up lid. It has a very plain handle. Governor A Drop head stand. The machine head drops down into this attractive five drawer stand, the paired drawers at either end are curved and the centre drawer swivels out and has holes inside to take five bobbins. The machine head in its operational position which clearly shows its very angular shape. When the leaf is opened the head rises on a chain. The side of the stand which has Governor not cast into it but riveted on. The case from a Singer 12, although there is some minor damage, the central decal is unusually intact and the wood has superb colour. The case from the Willcox & Gibbs showing the machine part in/part out. We have a little history with this one, tied to the handle of the carrying case were two labels, the sort you used to get on auction lots. The first was one for the Singer Sewing Machine Company Ltd 68 High Street Newport I.O.W (Isle of Wight). The label's red & white with black writing & looks 1960's. It's probably a service label & we can just make out the owners name. On the reverse it says "where there's sewing there's Singer" & below that "where there's Singer there's service". It's the second label we really like, it's for Harrods Depository, Barns, SW13 (London) and it gives the number of items deposited, name of owner, which is the same surname as the previous label & a date.... 4th January 1948. Seems strange but nice to know who owned it and exactly where this machine was all those years ago. The case from the Worcester Climax made by New Home, note the centre decal. The case requires a triangular key to open the lock. This series of photographs shows the ingenious way the machine folds out of its case which also acts as a work table.